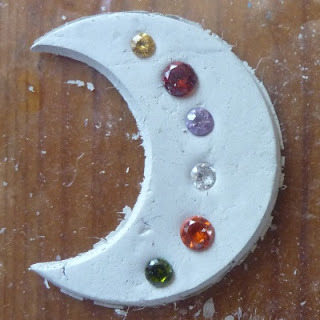 Little Harriet: P.M.C Moon - a tutorial of sorts. 2. rub a tiiiiny amount of olive oil onto the plastic wallet and rub some onto your hands, this will prevent the clay from sticking. 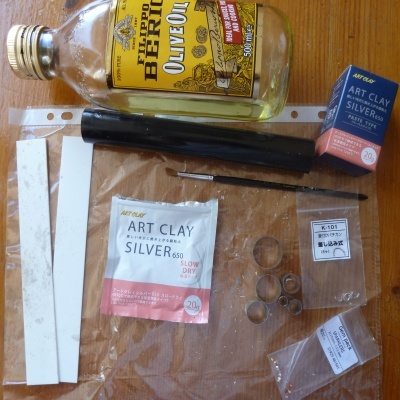 Try to use only a small amount as it can make the clay slide about. 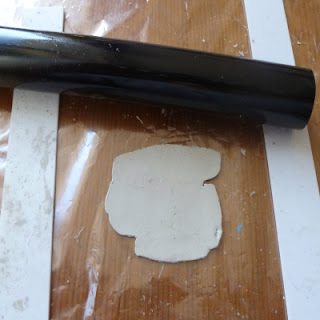 Using the guides, roll out the clay to a uniform thickness. 3. 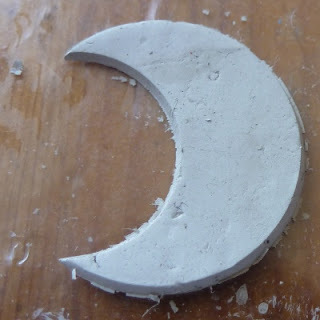 Cut out two circles, one as big as you want your moon to be and the other just big enough that it will take the bail (the clay will shrink when fired so make sure you account for this when choosing the small circle. 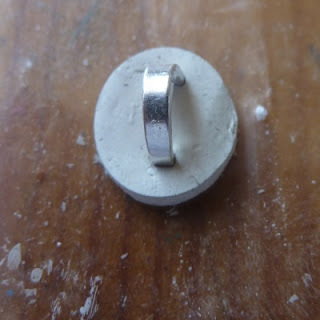 If the circles of clay wont come out of the cutters, use the paint brush to gently poke them out. Wrap the left over clay up and put away in the airtight bag immediately (it dries up very quickly). 4. Push the bail into the small circle and put to one side. 5. Use a slightly small cutter than the one you used to make the larger circle and position it on the clay so that when you cut it out it makes a shape you are happy with. 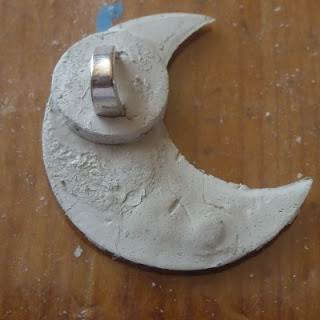 There are probably some moon shaped cutters out there but using two circles works. 6. you will end up with a shape like this. It looks a bit rough but it will be cleaned up when dried. 7. Push the gems into the clay. 8. 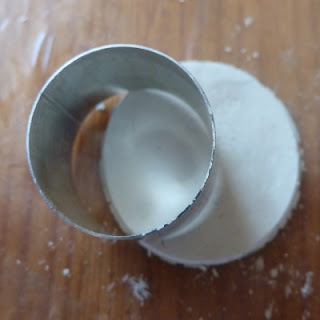 Turn the piece over and using plenty of paste on the paintbrush, "glue" the bail onto the back. 9. Leave the moon to dry overnight or you can use other methods. Some people use a mug warmer, other people put it in a slightly warm oven. I just leave mine overnight or place it somewhere warm. 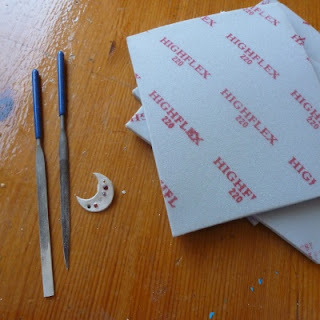 Just make sure the item is really dry before you fire it or it can crack.Once it is dry it will be really brittle so handle carefully, you can mend broken pieces with paste.Smooth rough edges with the needle files and the sanding pads. Spend a good while on this, you want a nice smooth surface for polishing once it is fired. 10. I didn't spend enough time filing and sanding around the gems, told you I was a beginner! 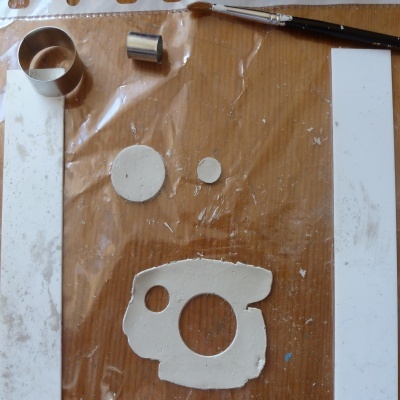 I should have filled in the holes with paste and let it dry again before re sanding... A lesson learnt for next time! 11. Once you are happy with how your piece looks, you can fire it! Metal clay can be fired in a kiln, with a small kitchen type blow torch or over the hob of a cooker. Follow the instructions in the packet for how long you need to keep the heat on for your chosen method. I'd recommend having a look at some youtube videos too, to get an idea of the different methods. Be safe! Things get really hot. 12. Once fired the piece will be white. You need to give it a good rub with a wire brush. Be careful, the wire bristles can hurt! Try not to scratch the gems. To get a mirror shine you need use the sanding pads, starting with the lowest number and working up. 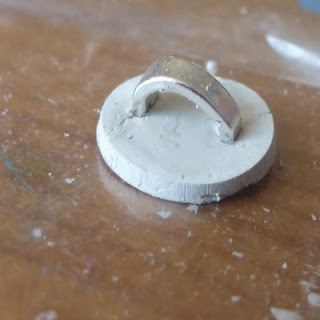 Rub with the sanding pads and don't move up to the higher grit until the sanding pad seems to "slide" over the metal. When you are satisfied that you have gone as far with the sanding pads as you can, give the moon a rub with some silver polish and a soft cloth. You can see in the pic of the finished moon where I haven't spent enough time working on the dry, pre fired piece, TAKE YOUR TIME!! It's so easy to want to rush and see what the piece looks like when fired. 13. 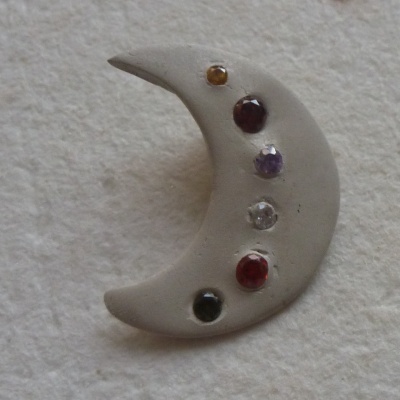 You can thread the moon on to some chain and then you can enjoy wearing your handmade, unique, piece of jewellery. Wow, that's fantastic - I'd love to try this. Thank you for taking the time to do this tutorial. It was interesting to see the process from start to finish. Nice work! I'd really love to try PMC sometime. A really beautiful piece - thank you so much for sharing it with us. It does look lovely. I received a Versatile Bloggers Award this week and am pleased to nominate you to receive this Award too. That's amazing! It looks so different at the end to the beginning! A very clear tutorial with lots of handy hints (and the reason why, thank-you for sharing. 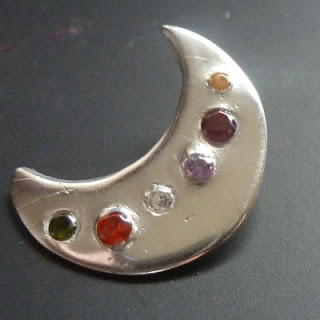 It really amazes me that you can make something that looks so amazing out of clay...if I ever finish working with concrete, I may have to have a go at some silver clay!